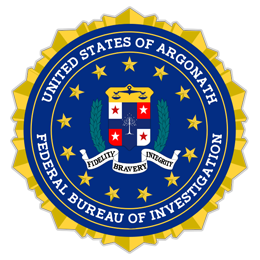 Argonath Federal Bureau of Investigation is an official establishment under the honorable President Gandalf and Prime Minister Aragorn. The Federal Bureau of Investigation is an organization of top level intelligence and law enforcement power to bring those who violate the Argonath constitution to justice. The Federal Bureau of Investigation is a fact gathering organization, using advanced technologies and managed by our highly and skillfully trained agents to gather evidence and combat against criminals and criminal organizations. Each installation of the Federal Bureau of Investigation field offices throughout Argonath in Liberty City, and Vice City and the federal headquarters of the State of San Andreas are lead by experienced members of law enforcement who coordinate their team with fidelity, bravery and integrity in the most challenging of situations and most crucial times of public safety and national security. "We are a fact-gathering organization only. We don't clear anybody. We don't condemn anybody". - J. Edgar Hoover The Federal Bureau of Investigation is always growing, with the threats of domestic terrorism, gang violence and hostage situations on the rise, we look for the brave and the honorable to step up and serve the United States of Argonath in the gravest of situations and protect the constitution and uphold those who breach it. There is no other organization like the Federal Bureau of Investigation, our training is specialized and designed to promote failure in which our cadets learn from to become better when it really counts, in the field. Not everyone will make it, but those who are truly dedicated and motivated to serve their country's citizens and bear the badge of the Federal Bureau of Investigation will succeed without regrets. The single most danger to the average citizen of Argonath is not an international terrorist, its your neighbors, those around you. The domestic grown crime rates are on the rise and are at all time high in our history. It is times like this the nation depends on our intelligence collection, interrogation and investigation skills to combat crime with the law. FBI - Officially April Fooled!